BentoLunch.net - What's for lunch at our house: Back to Bentos Tuesday! And we are finally back to bentos! It was a nice break, now we are ready to roll again and start Christmas bentos soon, probably in the next day or two. But for today, Mr. Ben needed to eat, so I had to toss something together for him. Ben has a sliced hard-boiled egg and pesto cream cheese rolls. I make the pesto myself, then mix a bit of that with a bit of cream cheese for a yummy sandwich spread. It's on Nature's Own 7-Grain Honey, which is my current favorite bread. Just roll it flat with a rolling pin, spread with cream cheese, roll it up and slice into rounds. It helps a lot if the bread is slightly warm (microwave for 5-6 seconds), bread from the fridge kind of cracks when you roll it. 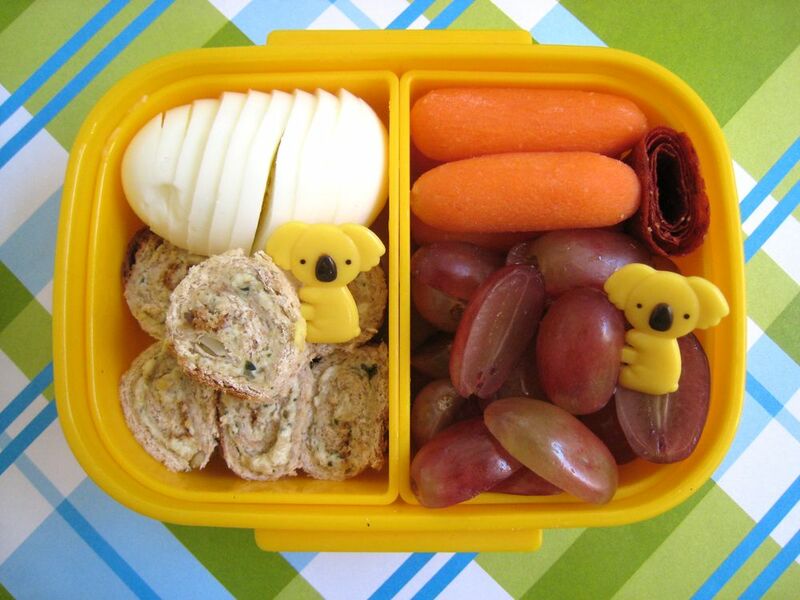 He also has grapes, carrots and a bit of strawberry fruit roll-up that I made the other day. We've got yummy brownies for after dinner, so I didn't have to worry about lunch treats today. Quick and delish! Oh, and I don't have extras of the giraffe picks. :( I have the other set, but not the giraffes. Good luck finding them, and if I make it to SF Japantown in Decemeber I will look for them for you. where on earth do you get this Nature's Own bread? I haven't ever seen it. Are the Lunchbots hard for a six year old to open by themselves? What kinds of fruit have you made into roll-ups so far? Kelli~ You can get the Natures Own bread at WM or Kroger.